Steiff’s very own cover girl! There are many great reasons to start a community site. Steiffgal created MySteiffLife so collectors from all over the world would have an online destination to learn and share information about vintage playthings from this remarkable toy company from Germany. That being the case, Steiffgal wanted to share this brief note from a collector in Germany who sheds some light on a Steiff mystery (at least to those of us here in the USA) that’s at least a few dog years old. Awhile back, Steiffgal wrote a post about a darling and beloved Steiff Cocker Spaniel dog named Revue Susi. Susi is sitting, made from blond mohair, and head jointed. Her head is quite detailed and completely adorable; she has large plastic pupil eyes, airbrushed “eyebrows” and lips, pronounced doggy jowls, and floppy ears made of long, lush mohair. 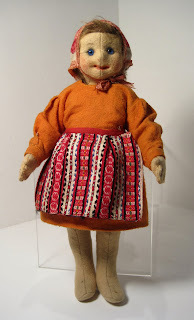 Revue Susi was produced in 4 sizes – 12, 17, 28, and 35 cm – from 1959 through 1977. Just found your wonderful blog on the internet. And I am happy that I can clarify the mystery over the name of Revue Susi for you. 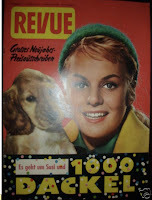 Revue was a German people-magazine from 1946 to 1966. Its mascot dog was Susi. But I believe that Susi was a dachshund (as there was a prize winning game, where you could win a sibling of Susi and the dog to be won was a dachshund!). 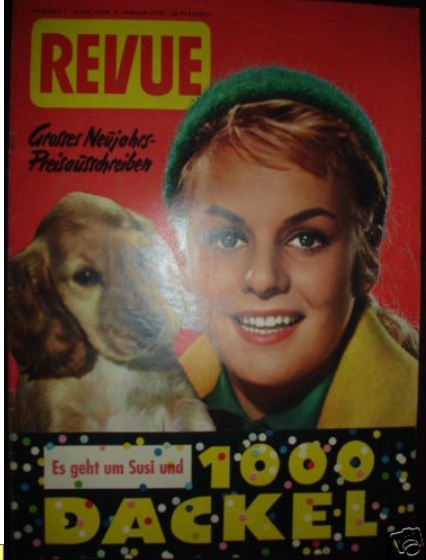 Claudia, on behalf of all the Steifflife readers, many thanks for this wonderful information on Revue Susi and the delightful magazine cover showing her probable namesake! What an interesting story! Steiffgal is certain that everyone would agree that this photogenic pup certainly lives up to her the covergirl (Steiffgal means cover dog!) legacy. Do you know any Steiff insights you would like to share? Send them to Steiffgal at Steifflife@gmail.com so she can share them here with our wonderful growing community of Steiff collectors. Have a question about one of your Steiff treasures? Let’s talk! Click here to learn more. Posted in Collectibles, My Antiques | Comments Off on Steiff’s very own cover girl! Love at first sight. Have you ever “felt” that way about a potential Steiff addition to your collection? Well, Steiffgal did recently, when she came across – and ended up buying – this remarkable turn of last century felt Steiff girl doll. Check out Steiffgal’s latest button-in-ear find and the interesting history and details behind this rare and unusual piece! Steiffgal saw this darling blue eyed beauty recently listed on eBay and knew right away this doll belonged in her collection. This tiny treasure is 22 cm, made from flesh colored felt, and is five ways jointed. She is firmly stuffed with excelsior. Her feet are very simple, but her hands have distinctive fingers and thumbs. Her belly has a seam down the middle which has been carefully sewn up by hand. 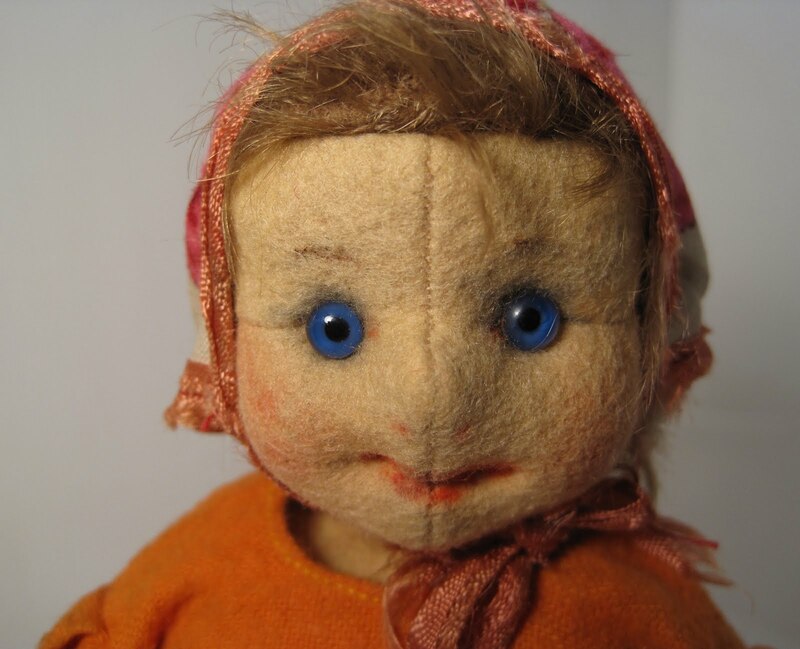 The doll’s face has the traditional center seam, peachy cheeks, a happy red mouth, and very detailed ears. She has very short mohair hair and a tiny (4 mm) Steiff button in her left ear, pictured here on the left. She sports a cheerful orange flannel dress; a thin cotton slip; a red, white, blue, black, and green apron; and a cream, pink, magenta, and green ribbon trimmed bonnet. 22 cm Steiff felt “child-like” dolls are a really unusual size and very few variations were made; the more typical size for this product line was 28 cm. The smallest felt dolls Steiff made pre-war were 20 cm, but these were character dolls and even rarer than the 22 cm dolls under discussion here. From 1917 through 1919, Steiff made three models of 22 cm boys and ten models of 22 cm girls. They were differentiated by their clothing and footwear styles. Each of these dolls had charming, well constructed matching clothing made from high end materials, including felt, velvet, calicos, wool, and embroidered muslin. Most of the 22 cm dolls all had hats, which exactly matched the fabric or theme of their outfits. They were also detailed with stockings and hand-made felt or leather shoes. This felt girl is a lovely doll but it is very hard to tell which exact catalog model doll she represents. Steiffgal is certain that she is not wearing “officially made” Steiff clothes. Her outfit is extremely well constructed but it is a bit more “peasant looking” and not nearly as color and pattern coordinated enough as the those that appeared on these dolls as they left the factory over 90 years ago. This outfit was most likely made for this doll by a talented seamstress using leftover fabrics and materials from another home sewing project. Besides her great looks and charming personality, one of the things that makes this doll so special is that she has a documented provenance. She comes from the estate Wildred and Oma Mangold, who died 2008 at the age of 90+. The Mangolds lived in Armstrong, Iowa. Oma was a school teacher. She married Wildred in 1941 and together they ran the local grocery store in Armstrong for many years. The Mangolds did not have children but were instrumental in establishing the local library where Oma served as president of the board. Wilfred collected clocks and Oma collected dolls. Oma’s collection included many foreign “souvenir” type dolls but also a Lenci, Kathe Kruse, this charming Steiff doll, and other china and bisque dolls. Steiffgal has decided to name her Oma (which means “Granny” in German) in honor of her original owner. Coincidentally, Steiffgal also had a Grandmother named Oma. Readers, as always, you are all dolls for reading this post to the end. Steiffgal hopes that you have found Oma’s story and history as charming as she is. Hands in the air! The wonderful long weekend that heralds summer has finally arrived here in the USA! To celebrate this most welcomed seasonal occurrence – usually accompanied by “hands on” gardening and BBQing – let’s take a look at some of Steiff’s finest handiwork, puppets from the 20th century! This article originally appeared awhile back in Teddy Bear and Friends, Steiffgal’s favorite collector’s publication. If you are not a subscriber, sign up today! Primarily known for their classic and endearing Teddies, animals, and dolls, Steiff also has a vibrant legacy of creating charming and beautifully made hand puppets. Some designs are based on popular Steiff patterns, some reflect heroes and heroines from folk tales and traditions, while others are original products of sheer creativity. As a lifelong collector and student of the Steiff brand, Steiffgal has always been fascinated by classic vintage Steiff hand puppets – those produced from the turn of the 20th century through the end of the 1960’s. So, let’s put a spotlight on some of these great players from Steiff’s “golden era” of producing hand puppets! First, let’s get on the same page of the program about what Steiffgal means by pre-1970’s “hand puppets”. Most interestingly, the basic design of these puppets hasn’t changed since their debut almost a century ago. They all are basically 17 cm, plus or minus a bit. Most have a relatively simple “glove-like” body with two floppy unjointed arms. Almost all have a hollow but hard, fully detailed, excelsior stuffed head. To use the puppet, a person would insert their hand into the glove, put their pinky into one arm, their thumb into the other, and their middle finger into the hollow head, which is supported by a cardboard tube up the center. Now onto the puppets themselves. Although the first Steiff catalog was produced in 1892, Steiffgal’s research shows that hand puppets did not appear in these publications until 1911. However, the designs for a puppet bear, cat, and dog had all been registered in a German patent office since 1909. Steiff used the adjective “Punch” to describe their earliest puppets; perhaps in reference to the traditional “Punch and Judy” puppet shows which regularly appeared across Europe in the late 19th and early 20th century. 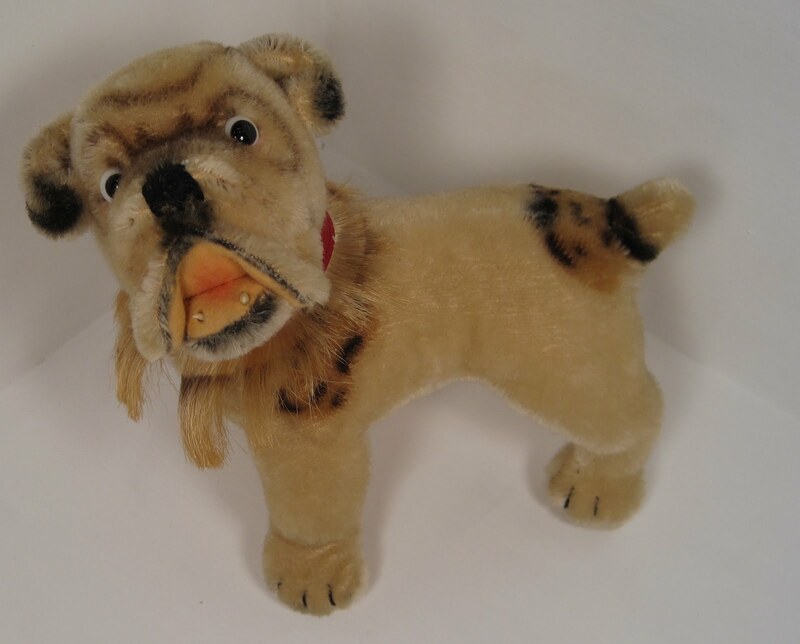 The earliest Steiff puppets produced included punch bear, punch Charles (a King Charles Spaniel), punch cat, punch fox, punch chimp, and punch fox terrier. Each was made from mohair and based on the most popular animals in the line at the time. Pictured on the left is a series of early punch chimps from 1911 onward. 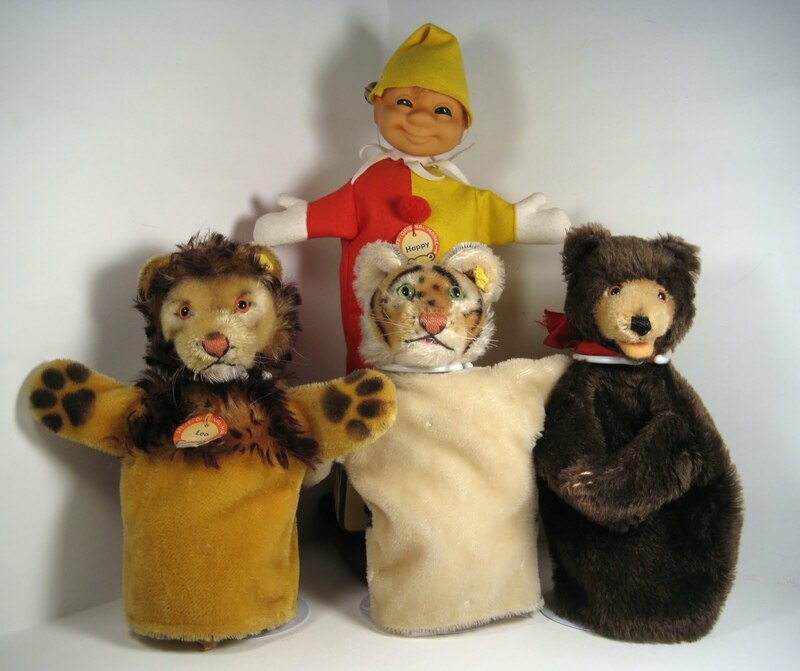 Many of Steiff’s most beloved classic characters were “born” in the 1920’s, so it is not surprising that most of them were produced as hand puppets around the end of that “roaring” decade. This allowed the company to meet the public’s growing demand for these wonderful “branded” characters as well as to expand their audience for these items. Models that made the transition from toy to hand puppet include Molly the puppy, Bully the bulldog, Petsy the blue eyed baby bear, Teddy baby, Siamy the Siamese cat, and Treff the bloodhound. As these items were all made for active play, very few have survived to this day; all are considered treasures and exceptionally rare – especially in good condition! Steiff had the license to manufacture several internationally known characters in the late 1920’s and early 1930’s. Two of these included Felix the Cat and Mickey Mouse. Of course, Steiff seized the opportunity to produce each as a hand puppet as well! Felix the Cat was produced from 1925 through 1926; he was 20 cm and made from felt and mohair. A 24 cm velvet Mickey Mouse was produced from 1931 through 1933. Both are extremely rare today and coveted among vintage Steiff collectors, puppet fans, as well as Felix and Mickey aficionados. The early post war years were a time of great creativity at Steiff, and this energy and “out of the box” thinking is evident in their hand puppet designs, too. The word “Hand” was substituted for “Punch” when describing these puppets manufactured after 1949, perhaps to “rebrand” the line as a modern plaything. As expected, production resumed on several pre-war hand puppet classics, including Jocko the monkey, Teddy baby, Molly the puppy, and a tabby cat. However, many new named designs were introduced as well, including Sarras the boxer, an updated Foxy fox terrier and Bully the bulldog, Dally the Dalmatian, Wittie the owl, Loopy the wolf, Snobby the poodle, Gaty the crocodile, Mungo the baboon, and Leo the lion. These “new designs” were made as toys as well as puppets; all were made of mohair. Steiff also introduced the first PVC/rubber headed puppets in the early 1950’s; these debut items included a dwarf, Santa Claus, and Mecki hedgehog. Most of these items were produced in large quantities and were distributed broadly; as a result they are relatively accessible to collectors today. In addition to these post war hand puppets, Steiff also briefly produced a new style of mohair puppet from 1958 through 1959. Called “Mimic”; these items were five finger hand puppets with four posable limbs and a movable mouth. Three models were produced: a 28 cm Mimic dally Dalmatian, a 28 cm Mimic Biggie beagle, and a 17 cm Mimic Tessie Schnauzer (pictured to the left with a 1960’s-era Peky Pekingese puppet). Their short appearance may have been the product of a complicated and expensive manufacturing process and less than expected sales. As a result, the short supply of these puppets translates into a high demand among collectors. The 1960’s were a very playful era at Steiff in terms of hand puppets. 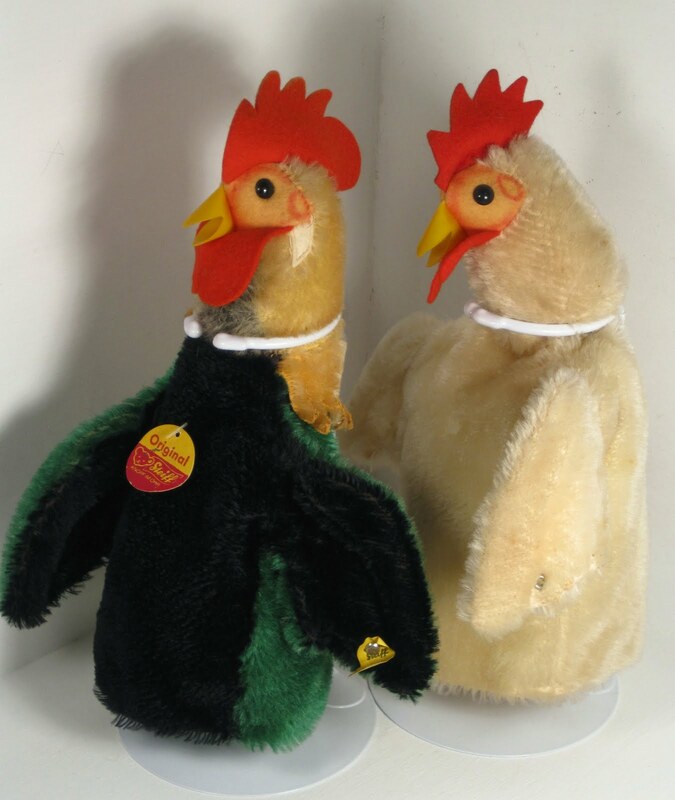 Several more “unconventional” designs were introduced, including Hucky, a black raven; Hopsi the squirrel; Peky, the Pekingese; a penguin; a rooster; and a hen (pictured here on the left). Surprisingly, several hand puppets from this decade – despite their relative “newness” – top the “wish list” of many Steiff collectors. These include Snaky Snake, a gloriously airbrushed puppet with an unusual snap mouth and felt tongue; Sneba, or Snowman, a white dralon snowman with a carrot nose, a black top hat, and “coal” buttons; and Blacky the Chimney Sweep, a rubber headed character with a black mohair body, black top hat, and ladder. Each was produced for less than two years. As a result, they always generate a lot of interest when they come up for sale. You’ve got to hand it to Steiff, whatever they do, they do it just right. Steiffgal hopes you give thumbs up to this salute to vintage Steiff hand puppets… and a high five to the creative teams at Steiff who brought these precious playthings to life over the years. Have a question about one of your Steiff treasures, a puppet or otherwise? Let’s talk! Click here to learn more. Steiffgal is nothing but a big toothy grin this week after receiving a positive report about a family member who soon will be returning to good health. 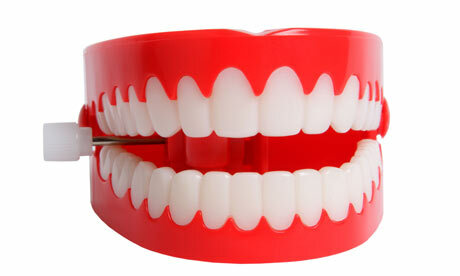 No one can disagree that a smile certainly looks better, and feels so much better, than a frown! In celebration of good news – and the hopes that some is also headed to each and every SteiffLife reader – the time is certainly right to quick look at some vintage Steiff collectibles known especially for their distinctive smiles and gleaming pearly whites! 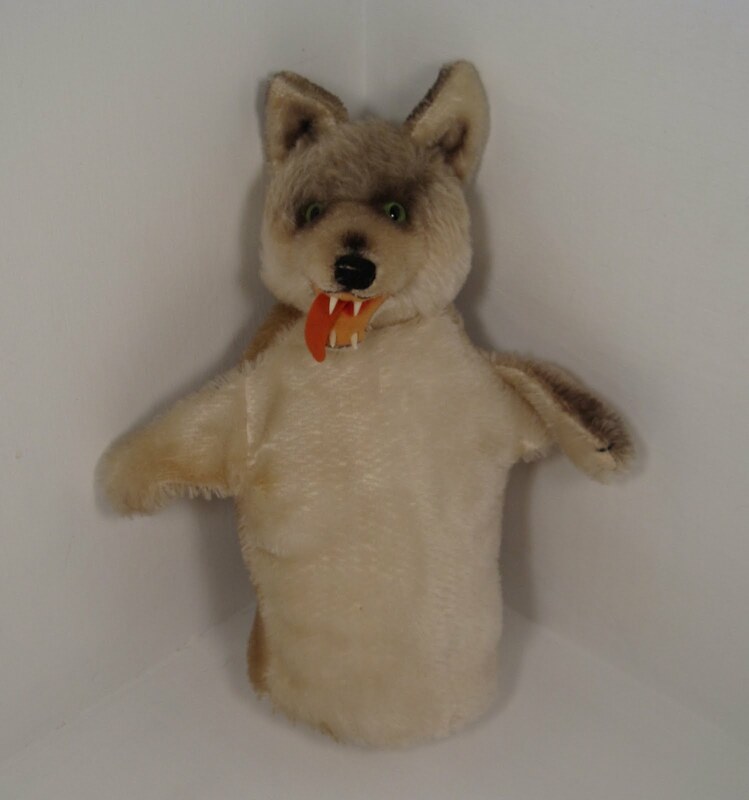 Let’s first give a hand to terrifically toothsome Hand-Wolf Loopy or Loopy wolf puppet. Loopy is 18 cm and made from white and gray mohair . His face and the tips of his paws, ears, and nose are detailed with lightly applied black airbrushing. Loopy has green glass pupil eyes and a black stitched nose. His most prominent feature is certainly his mouth; it is open and lined in peach colored felt. He has a pinkish colored tongue and four not-so-sharp plastic canine teeth. 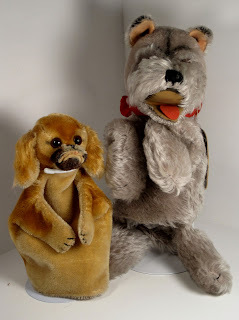 Loopy as a puppet appeared in the Steiff line from 1956 through 1978; this model was also produced in 1964 as a full fledged standing item in 25 and 35 cm. This next item is “l ong in the tooth”, both literally and figuratively! Here we have Paddy Walross or Paddy walrus, with his remarkably long white wooden tusks. Paddy is 14 cm and made from dark tan mohair that has been airbrushed with brown shading and spots. He is in what Steiff refers to as a “begging” position. Paddy has black and white googly eyes, a pink stitched nose, and mono-filament whiskers. His “moustache” is made from longer, stiff mohair, which has the look and feel of the mohair used on Steiff hedgehogs over the years. 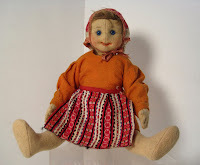 Paddy was made from 1959 through 1965 in 10, 14, and 22 cm. Care to share a “spot” of tea with this smiling Englische Bulldogge or English Bulldog? This champion canine is 18 cm, standing, and head jointed. He is made from tan mohair that has been very carefully hand detailed with multicolored airbrushed “spots” over his body and tail end. He is has the most “sturdy” look and feel about him! His face is also painted with “wrinkles” on his forehead. He has black and white googly eyes, a black stitched nose, and outstanding mouth-area “jowls”, much like a real bulldog. He has an open, peach colored felt mouth with two lower pointy canine teeth. And just to prove he’s top-dog, he sports a red leather collar and a horse hair ruff. This English Bulldog was made from 1956 through 1961 as a United States exclusive, most likely appearing on the shelves of high end retailers such as FAO Schwarz. Steiffgal alw ays likes to end on a high note, but in this case our final item today is truly out of this world – both in terms of looks and scarcity! 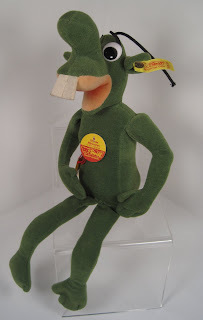 This majorly-toothed martian is Steiff’s Gruenes Maennchen, or Little Green Man. He is 35 cm tall and made from green colored trevira velvet. His proportions are much like Steiff’s iconic “lulac” animals, with their long torsos and dangling limbs. His arms and legs have wire armature so they can be posed in playful ways. His face is utterly charming. He has enormous black and white googly eyes, one thick black strand of “hair” on his forehead, pert ears, a prominent bulbous nose, and an open mouthed ear-to-ear grin. And of course… a huge set of white felt buck teeth. Little Green Man was designed for Steiff by the Belgian artist Mallet and was in the line from 1982 through 1984. It is most unusual for Steiff to produce items designed by people outside the company so his pedigree, in combination with his limited time of production, puts him on the “wish list” of many collectors around the world. Mother Teresa once said, “Every time you smile at someone, it is an action of love, a gift to that person, a beautiful thing.” Steiffgal hopes this column gave you a smile, and that you pass that goodwill onto someone else today, too! 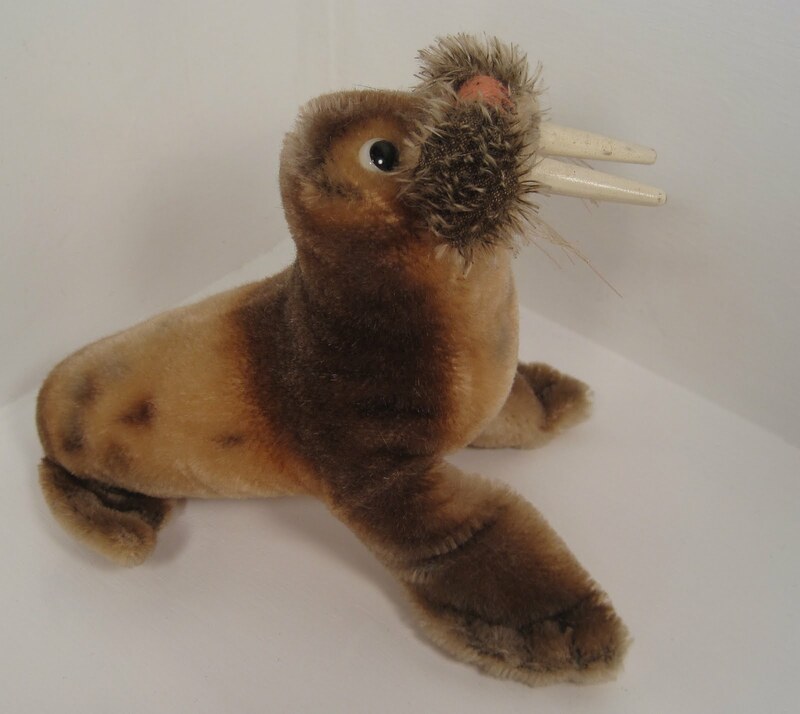 Have a question about one of your Steiff treasures, toothy or otherwise? Let’s talk! Click here to learn more. This American Folk Art Painting Is Worth Its Weight In Gold! 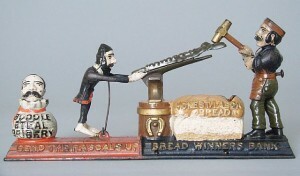 Who says vintage American folk art isn’t worth its weight in gold? The scales are definitely tipped in favor of this delightful painting I found last weekend at the New England Antique Show’s Spring Fever Antiques and Design Show and Sale. Let’s take a listen – and a look – at this intriguing piece of nautically inspired artwork by Cape Cod artist Ralph Cahoon. Click here to see a video discussion of this great piece of art! What “hangs in the balance” here is a painting entitled “Weighing in the Catch.” The piece itself is oil on board and measures 13.75″ by 11.5″. 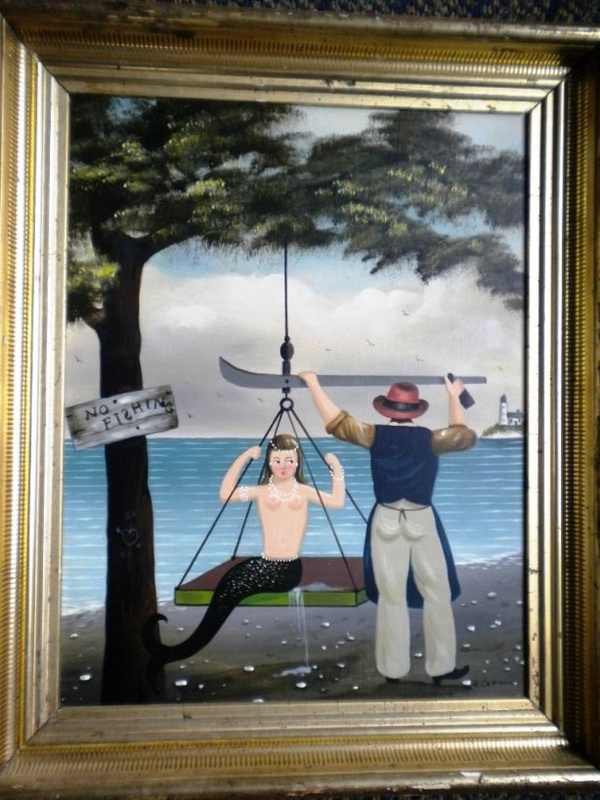 The painting depicts an unfazed fisherman “weighing” a lovely, bejeweled mermaid, much like he would his daily catch of cod or flounder. But this take is clearly a dreamy “catch of the day!” Don’t you wonder what he’s REALLY thinking? 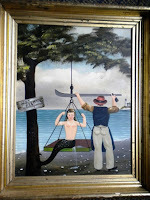 The painting’s details include a folksy “no fishing” sign crookedly hammered to a tree, a calm ocean bay, and a lighthouse in the background. It would be fair to say that Cape Cod and the Atlantic 0cean were pivotal influences in Ralph Cahoon’s life and career as an artist. Born in Chatham, Massachusetts in 1910, Ralph spent his early years on the beach, sailing, and fishing – and skillfully sketching these carefree pastimes for fun. In 1932, he married fellow Cape-Codder Martha Farham. Martha and her family were known for their talents in hand painting furniture. After Ralph and Martha married, they started their own very successful decorating and antiques business in Cotuit, Massachusetts. They would paint tables, chests, chairs, boxes, bookcases… just about anything that suited their fancy. Their collector base for these one-of-a-kind items really started to expand. Fast forward a few years to 1953 and the Cahoons started reeling in the big catch. Ralph and Martha’s work was noticed and promoted by the wealthy New York socialite, art dealer, and future co-owner of the New York Mets, Joan Whitney Payson. Payson worked with the Cahoons to transition their talents from furniture decorating to wall art painting. She framed some of their paintings and displayed their works in her upscale Long Island shop, called the Country Art Gallery. They became a sensation among affluent New Yorkers, who loved them for their happy, innocent themes of carefree life by the sea. Ralph’s works depicting playful, not-quite-risque mermaids became his “signature” pieces. The Cahoons would go on to an almost 30 year career of commercial success, showing at galleries across the United States and through their own studio on Cape Cod. Ralph passed away in 1982, at the age of 72. He continued to paint up until his last days. Martha lived through 1999, and like Ralph, was an active artist until the end. After Ralph died, Martha sold their Cape Cod home and studio to Rosemary Rapp, a friend and local art enthusiast who converted the building to an art museum. Today, the Cahoon Museum of American Art features works by both Ralph and Martha Cahoon, contemporary artists, as well as other well known 19th and 20th century artists including Alvan Fisher, Ralph A. Blakelock, Benjamin Champney, and Martin Lewis. It is a wonderful destination for art lovers visiting Cape Cod and well worth the trip. Today, Ralph Cahoon’s works continue to be of great interest for collectors. Recently, several larger pieces have sold in the $150,000 range. This particular work, Weighing in the Catch, is available for $15,000 from Bradford Trust Fine Art of Harwich Port, Cape Cod. Net-net, I would like to thank Roy Mennell of Bradford Trust Fine Art for hooking me up with this great piece of fishing-inspired American art. Bradford Trust Fine Art offers a wide selection of American and European 19th and 20th century art and specializes in artworks of coastal New England (including Maine and Boston area) and Cape Cod, particularly Provincetown. For more information about this piece, please contact Roy at bradtrust@comcast.net. Posted in 20th Century Decorative Arts, Collectibles | Comments Off on This American Folk Art Painting Is Worth Its Weight In Gold! (More) oodles of Steiff poodles! I recently bought some old dolls, toys and a few Steiff animals from a woman who had them as a child in the 1950’s. I have not been able to identify a large white poodle anywhere online. He stands about 20″ tall from paw to top of head and 20″ long from head to tail. He has a jointed head only. He is mohair and dirty. He has a Steiff button in his right ear and a tag on one leg which is somewhat frayed. He is stuffed, but not soft. What Stephen h as so fortunately stumbled upon is an outstanding poodle that was made for one year only, in 1952. This precious pooch’s name (like many of the Steiff poodles) is “Snobby”. Snobby was produced in 17 and 28 cm in both black and white. He is made from wool plush, with a French trim (meaning a long mohair front and a short mohair rear), and has a swivel head. Because he is described as “hard stuffed”, he is probably filled with excelsior, which is wood-wool shavings. There are three several things, besides his really limited appearance in the Steiff line, which make this poodle most interesting from a collector’s perspective. The first is the wh ite tag that Stephen mentions in his note. This is a US Zone tag, which shows that this poodle was made shortly after the factory in Giengen, Germany reopened after World War ll. This small white linen tag with black lettering appears (or appeared, it tends to get loved off) on all Steiff items produced between 1947 and 1953. The second is his rare button. As you can see, This Snobby poodle is sporting a very unusual “knopf im ohr” which has the word “Steiff” in raised in block capitals. (If you click on the picture it should enlarge…) This identification was only used from 1947 through 1952. To put things in perspective, Steiffgal only has 3 vintage Steiff items with this “all capitals” button out of a collection of several hundred vintage items. And third is his name. This Snobby is the namesake grand-daddy of all Snobby poodles as he is the first and ORIGINAL Snobby in the Steiff line! Steiffgal hopes that this second column on these handsome hounds has doubled your interest in Steiff poodles! Finally! After looking for almost ten years, Steiffgal finally landed one of her dream pieces! After waiting for several anxious weeks – after all, the package was being mailed from overseas – the box finally arrived and was delivered to Steiffgal’s front step. With great excitement, Steiffgal opened the carton and right away… she knew she had it “maid” in the shade with her newest vintage find, a Steiff poodle named Maidy. So just who is Maidy, and what makes her so special? Maidy is one of those Steiff “One-derful” items, made for just a year or so. Specifically, she appeared in the Steiff catalog in 1959 only. This black mohair beauty is standing and unjointed. She has a slightly longer mohair “beard” around her chin. Her mouth and claw stitching is done in mauve colored embroidery floss. She was produced in 25 and 30 cm; Steiffgal’s Maidy is the 30 cm version. There are two things about Maidy, besides her very short time in production, that make her really remarkable. First are her eyes. They are gorgeous, large hand blown almond shaped “peepers”; each has a black pupil, brown iris, and white corners. Readers may recognize these eyes as the same ones that appeared on the pre-war and early post war Steiff little black Scotty dogs. The second is her remarkable mohair covering. It is analogous to the look and feel of “Persian Lamb”, that is, it is distinctly bumpy and textured, with the mohair woven in tightly wound clusters. The only other Steiff item that Steiffgal can think of that uses this textured mohair is (not surprisingly…) Swapl, the black Persian lamb, made from 1957 thorough 1964. Maidy is an interesting and unusual branch on the Steiff family poodle tree. As a matter of fact, poodles are a legacy breed for Steiff; so much so that at least two of these standing curly coated cuties appeared in the debut catalog of 1892. Soon after, in 1894, Steiff introduced a sitting model which was produced through 1905. In 1908, Steiff gave their poodles a “makeover”; giving them a more toy-like in appearance and configuring them in a playful, begging position. Begging poodles were reintroduced in 1929 after a few years break and remained in the line until 1935. The pre-war tail-turns-head begging poodle, introduced in 1931, was reproduced as a Steiff Club limited edition replica in 1996. 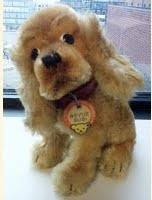 Steiff poodles made an almost constant appearance in the Steiff line post WWII though the end of last century. Tosi, a wool plush poodle made in black or white, was introduced in 1950, just a few years after the factory reopened for business after the war. She was quickly followed by one of Steiff’s most beloved and popular dog designs, Snobby the Poodle. This classic Snobby pattern made her grand debut in 1953 and appeared in the line through 1974 in 10, 14, 22, 35, and 43 cm. Snobby was produced in gray or black mohair, was jointed, and had a little round red felt tongue. Her coat was cut in what Steiff refers to as the “modern trim”, meaning that her limbs, face, tail tip, and head crown were long mohair, while her body and neck were short mohair. This Snobby pattern proved so popular that she was soon being produced in as a riding toy, a puppet, and as a soft, curled up resting animal. Fast forward a few years post the classic Snobby period, Steiff continued to produce dozens of mostly soft plush play poodles in white, black, gray, and brown through the next three decades. The photos above on the left show some of the better and lesser known post-war Steiff poodles; pictured here are a grey mohair 35 cm lying Snobby poodle (1955 – 1967), a black mohair 14 cm black Snobby poodle (1953 – 1974), a 12 cm white plush Whitey poodle (1978 – 1984), and a pair of black plush 50 cm standing and begging studio poodles (1978 – 1984). Steiffgal hopes this column has noodled your interest in these well-coiffed Steiff canines! Have a question about one of your Steiff treasures, big-haired or otherwise? Let’s talk! Click here to learn more. 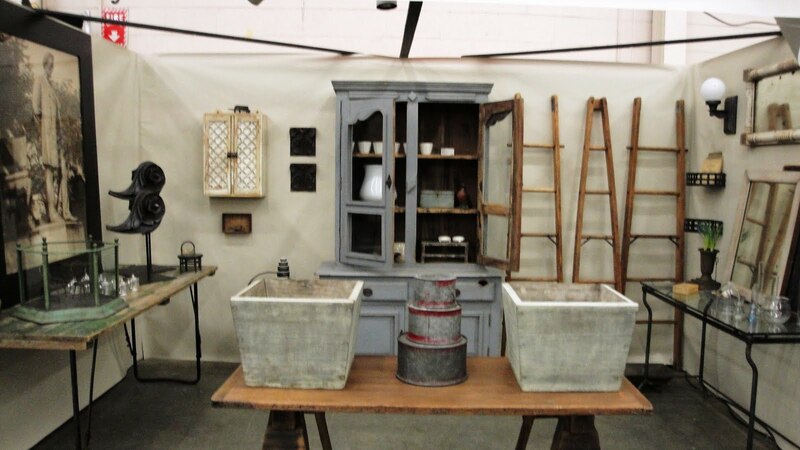 Keeping you appraised of an antiques and design show you just can’t miss! I can’t wait to see you at New England Antique Show‘s much anticipated Spring Fever Antiques and Design Show and Sale! This event – truly a breath of fresh air – is April 24th from 10am to 5pm and April 25th from 11am to 4 pm. 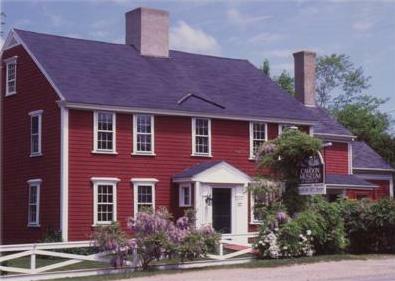 It will be held at the historic Concord Amory, located at 91 Everett Street, Concord, Massachusetts. There is plenty of free parking. And speaking of a good deal, click here for your two-for-one admission coupon, just for VIPs! (Val’s Important Pals!) Otherwise, a weekend pass is $7; Sunday only is $5. Children 16 and under are admitted free with the purchase of an adult ticket. It goes without saying that this show is a “can’t miss” for anybody interested in antiques, collectibles, and decorative items for homes and gardens of any size. Over 40 dealers from 10 states will showcase outstanding items just in time for the spring wedding, graduation, and Mother’s Day season. Expect to find treasures including estate jewelry, fine art and pottery, toys and games, rare books and maps, tabletop settings, furniture, rugs, silver, china, glass, and crystal. Here on the left you see a wonderful garden antiques display by Debra Queen of South Dartmouth, MA, who will be bringing her delightful wares to Concord. Personally, I hope to find some Fenton glass for my Grandmother, Blue Willow china for my Mom, and mohair Teddies and animals for me at the show! And what’s an event without a special guest? In addition to high quality, exceptional merchandise, the show also features a valuation clinic lead by industry veteran Linda Roberts, an accredited member of the International Society of Appraisers (ISA). Linda has vast experience identifying and valuing the full spectrum of vintage and antique collectibles. Linda looks forward to speaking with you about your special treasures you bring from home. Who knows…maybe that vintage vase you picked up at a tag sale for $0.50 a few years ago really is worth something? It’s certainly worth finding out! Each of Linda’s valuations is $5 with a show admission ticket, with a maximum of three items per person. All proceeds from the clinic will go to the Family Readiness Group of the 182nd Medical Company of the Concord Armory. Linda: Sure. An appraisal is a written, bound document with extensive research, photos and opinion of value usually done for a specific purpose such as estate taxes, insurance etc. A verbal approximation of value, which is what is given at events, fairs, shows, etc., is just that, a verbal approximation with very little or no research. Nothing is in writing. Val: Can you tell us about the most unusual item brought to you at an event? Linda: Let’s see. I think the most unusual item was a dress worn by Judy Garland. The woman who brought it to me owned a costume store and would buy clothing from a dealer that purchased items from sales at movie studios. This dress had a label stating that it was Judy Garland’s costume. It dated from around the 1940’s. It was very difficult to assign a final value to it without more research; for example, the movie in which it was worn would contribute to its value. In a case like this, the owner was told to do some detective work and identify the movie in which the dress appeared. I suggested calling the archives at the studio or simply watching old movies! I eventually valued the dress in $1,800 to $2,300 range. Val: Wow, that’s so cool! Can you tell us about the highest valued item you have assessed? Linda: Sure! I was examining items in a home for an estate tax appraisal. I was crawling around a small storage area and found a few old paintings. One in particular was interesting to me because I recognized the artist immediately, even though it was in terrible condition. I discussed the painting with my client and told him it was painted by one of the “Philadelphia Ten” by the name of Fern Coppedge. Fern was an American artist who lived from 1883 through 1951. I was able to broker the painting and it sold for $250,000! The client was very happy and told me that if I were not there he would have sold the painting for $25 at a house sale! Val: A quarter of a million dollar windfall… not bad! Have you ever been stumped by something someone has brought to you? Linda: Of course. No appraiser knows everything. It is important for the appraiser to know their limitations. It is not unusual for an appraiser to give a referral instead of a value especially at an appraisal fair. Sometimes the referral is to another expert or to do some detective work on their own. Part of our expertise is to have extensive contacts in all fields. A good appraiser will reveal their specialties. Val: Speaking of specialties, are you a collector of anything? Linda: Yes, I am a collector! I love books with great illustrators such as those done by Margaret Tarrant. I love hand-painted porcelain as well as Lalique glass. My favorite is a rare large cockatoo that stands approx 12″ tall and has a 12″ wing span. 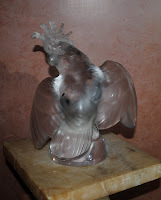 He was made by Rene Lalique in the early 20th century. To the left is a picture of my collectible cockatoo for your readers! Val: Thanks for your insights and looking forward to meeting you – and all of our community site readers – soon in Concord! 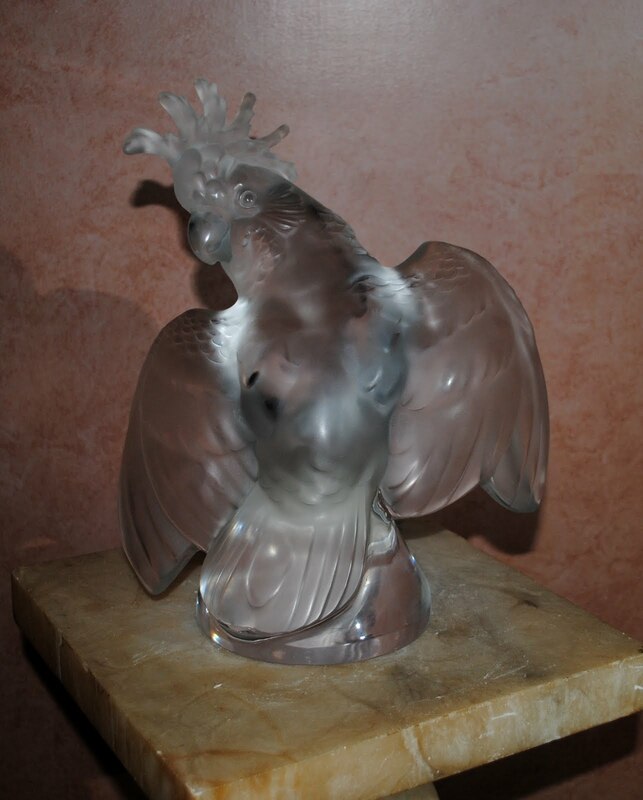 And hopefully there is a Lalique treasure just waiting for you there! The Spring Fever Antiques and Design Show and Sale is produced by Marvin Getman of New England Antique Shows. For more information please call (781) 862-4039 or visit NEAS’ website at www.neantiqueshows.com. Posted in 20th Century Decorative Arts, Collectibles | Comments Off on Keeping you appraised of an antiques and design show you just can’t miss! I have a query about a little hedgehog that I got for Christmas from my dad, who knows that I love hedgehogs. From the tip of his black nose (some sort of plastic ball) to his furry rear end he is about 6 inches. He has two felt front paws, two circular felt ears, and little round black eyes. He has a Steiff button and tag in one of his paws and it says: original Steiff 1670/10 Made in Austria Preis- Price. On the back of the tag it says that he is made from cotton and wool and the number is PA 55 MASS 73. He has airbrushed dark brown lines on his face, and his fur is mainly made up of long, stiff fibers which are light tan at the tips and darker brown near his body. His belly is flat. What can you tell me about his make and the time period when he was produced? I have attached some photos for you. Let’s shine a little light on Eryka’s nocturnal buddy. What you have here is what Steiff calls Joggi Igel or Joggi Hedgehog. He is made from spiky “tipped” (meaning that the fiber ends are dyed a different color than the entire length of the fiber) mohair, in a lying position, and has a flat bottom. His sweet tiny face, ears, paws, and underside are made from grey felt. 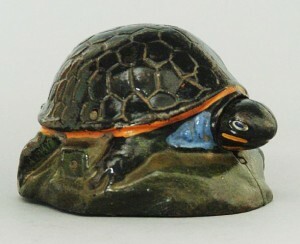 This particular Joggi was made in 6, 10, and 17 cm from 1966 through 2002. Eryka’s Joggi, number 1670/10, dates him in the 1968 to 1985 production period. Today, hedgehogs are quite prolific in the Steiff line – but that was not always the case. The first hedgehog, as far as Steiffgal can tell, appeared in the Steiff catalog in 1951. Also named Joggi, this standing hedgehog was 12 cm tall and made from mohair from 1951 through 1977, and then mohair and dralon from 1978 through 1985. In 1961, a very similar 12 cm standing hedgehog design was produced; he was manufactured through 1966. Since the 1960’s, hedgehogs in all shapes, sizes, and materials have made regular appearances in the Steiff catalog, appearing as play toys, collector’s editions, woolen miniatures, puppets, wooden pull toys, a purse, and even a golf club cover! The current Steiff line features a tiny Steiff hedgehog keyring, which has the charming looks of the Eryka’s vintage Joggi. And just why do hedgehogs seem to all of a sudden to be in the Steiff spotlight in from the early 1950’s onward? Steiffgal has a two word theory on this: Mecki and Micki. 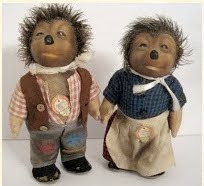 This beloved and well known (at least in Europe) hedgehog cartoon couple was first designed in Germany in 1940 by the artist Ferdinand Diehl. They became much more famous in the early 1950’s with their regular appearance on the German TV magazine HORZU. 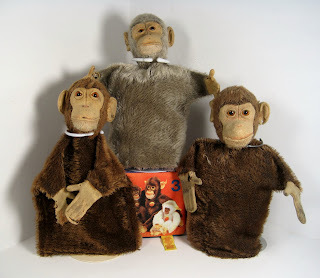 The Diehl Film company from Munich granted Steiff the licensing rights to produce the dolls in 1951, and they have been a mainstay in the line to this day. Both Mecki and Micki have been produced in 17, 28, and 50 cm from 1952 onward; a 100 cm Mecki was produced in 1967, perhaps as a special window display. The spiky tipped mohair that has been used for Mecki and Micki’s hair over the years hasn’t changed, and is almost identical to the spiked mohair used on most other mohair Steiff hedgehogs, even today. Steiffgal hopes this quick review of the history of Steiff hedgehogs has “tipped” you off to a new area of collecting! Have a question about one of your Steiff treasures, nocturnal or otherwise? Let’s talk! Click here to learn more. As children, we rarely gave thought to caring for our toys. They were made purely for our entertainment, and not to be dusted and kept on the shelf. I had my share of Barbie’s who’s hair was cut, colored with a magic marker, and occassionally chewed on by the dog. My brother could tell you all about flipping baseball cards, creating racetracks for his Matchbox cars and the autographs he collected over the years being a serious sports fan. Sometimes, when I see a toy I played with as a kid in an antique shop it makes me pause. I wonder, had I taken care of those Barbie’s – what would they be worth today? How many rookie cards did my brother bend, tear and flip that would add up to some serious coin now? Gone are the days for the $6.00 Barbie. Now, they are designer inspired and can cost a few hundred dollars right off the shelf. How can you justify spending that price when you know they are going to take them out of the box, lose those “designer” shoes within the first week, and potentially get a fresh look by your daughter and a pair of scissors? Will these toys increase in value over time if you buy them, and place them on the shelf only to be admired from afar? I don’t have a magic 8 ball to answer that question, but recently I read a press release about a few toys that have increased, just a little, since originally sold. The sale consists of 360 lots, which translates to, something for everyone. 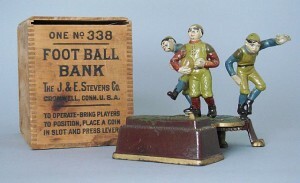 A portion of the collection up for sale came from Richard Stevens, an avid mechanical bank collector. Stevens was known for buying only the best. The best meaning the rarest, and those in the best condition. I would have to imagine when these were first produced, the cost was a few dollars (if that). 80-100 years later, their value has increased exponentially! I find it a bit ironic. A toy created to help children save their money becomes more valuable than the coins placed in it.